A whole neighbourhood designed in Amsterdam's indigenous architectural style, the Amsterdam School. Most people think of canal houses and funky gables when they think of Amsterdam architecture. Oh, and bricks of course. 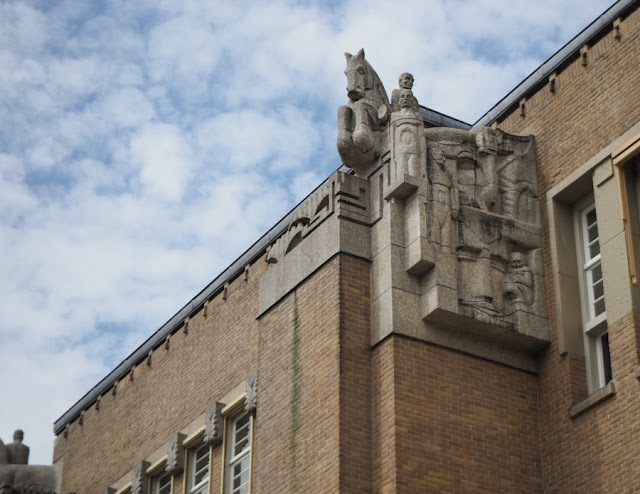 But many locals are very proud of their other indigenous architectural style: de Amsterdamse School. 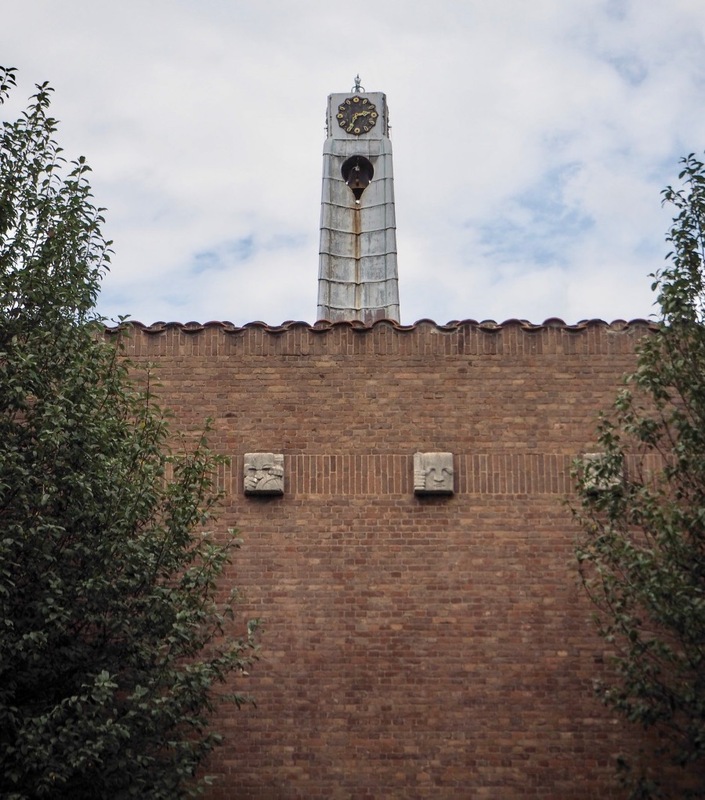 As the city expanded in the early 20th century, a group of young architects started thinking outside of the proverbial box and created a whole new architectural style. They wanted a radical break with the past. 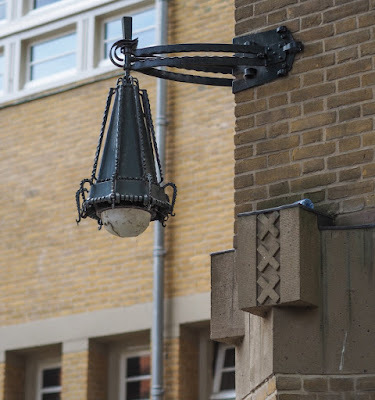 There is one thing they did not abandon: bricks, that quintessentially Dutch building material. You never knew what you could do with bricks and roof tiles until you've taken a walk through this neighbourhood. Plan Zuid is in the South (Dutch: Zuid) of Amsterdam. Easily reached by tram or bike, and only a short hop from the tourist-filled center. Map. AT THE END of the 19th and the beginning of the 20th centuries, architecture was very much about recycling. Recycling earlier building styles, that is. So the great buildings of this era are all built in styles that start with 'neo-': neo-classical, neo-gothic, neo-renaissance... Great examples are the Rijksmuseum and the Central Station, two buildings that most visitors to Amsterdam are very familiar with, and which are veritable mash-ups of everything from Renaissance palazzos to Gothic churches. A groups of young Dutch architects, fed up with these faux 'ye Olde Dutch' buildings, decided it was time to create a style that was fit for the Brave New World of the 20th century, a break with the pre-industrial era, and at the same time firmly rooted in Dutch traditions. 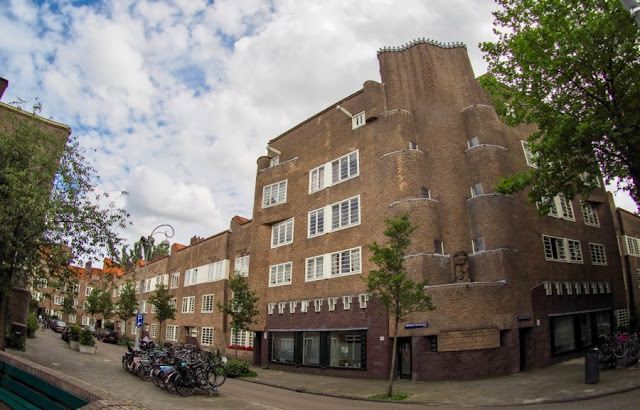 The style came to be known as the Amsterdam School, because it was born here and, for a short period, widely practised in the newer parts of town. 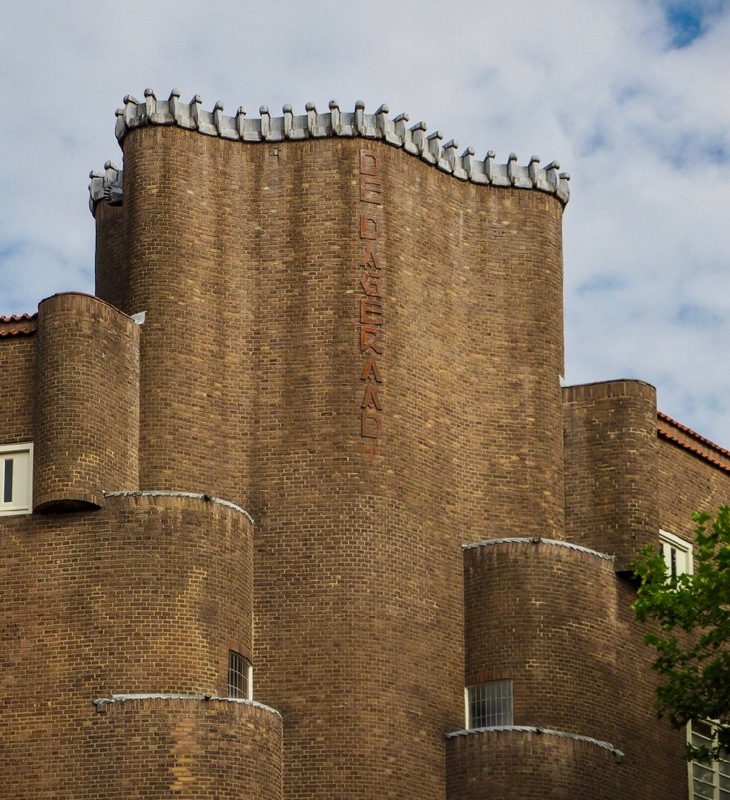 Contemporaneous with Bauhaus, Art Deco and the first years of the Soviet Revolution, the Amsterdam School took a unique Dutch take on architecture. Essentially, these architects combined Socialism with Art Deco, with the aim of building palaces for the paupers, aiming to elevate the illiterates. In Paris and the US, Art Deco became a luxury style, a grand statement for the elite. In egalitarian Holland, Art Deco design became part of a grand proletarian project. Architects of the World, Unite! 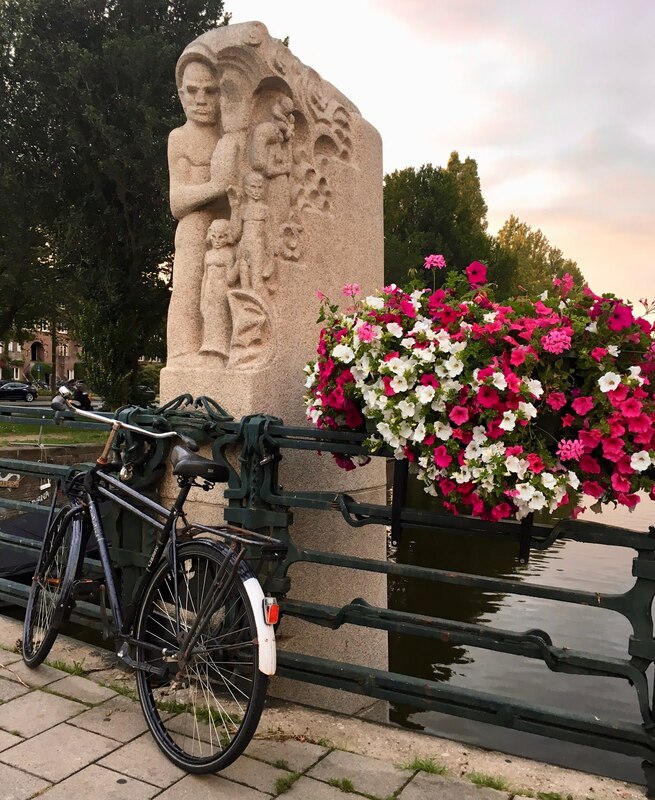 Amsterdam was bursting at the seams after the Industrial Revolution, with lots of workers moving into the city, and the city lacked adequate housing. 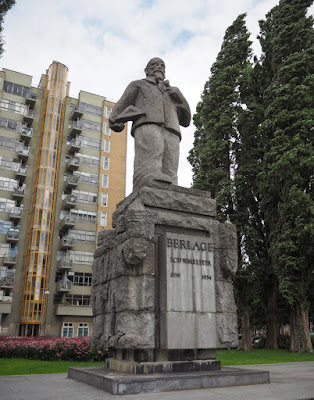 The first plan for expansion on the city's South side was drawn up by H. P. Berlage, the city's most famous urban planner, in 1904. However, the City Council sent him back to the drawing board, literally, and it wasn't until 1917 that a plan by his hand was finally signed off. 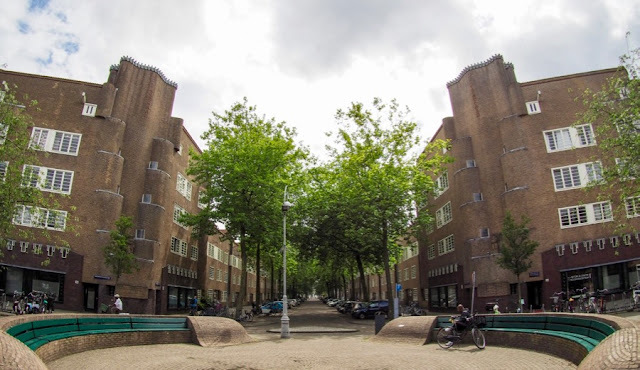 Berlage's name is often associated with Plan Zuid, but he merely laid out the urban space: streets, squares and boulevards. Other architects had to fill in the details, and many of the houses were designed and built by younger architects. H.P. 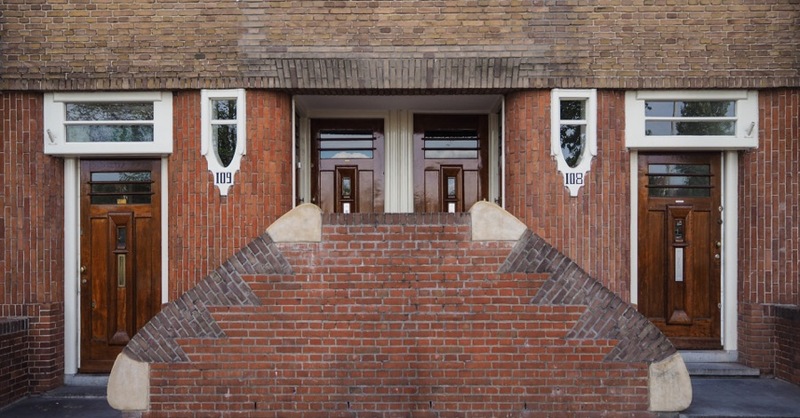 Berlage himself, the 'Building Master'. Behind him looms Amsterdam's first skyscraper. Let's start this visit at the heart of the neighbourhood. Burgemeester Tellegenstraat is named for the mayor (Burgemeester) who led the urban planning process. 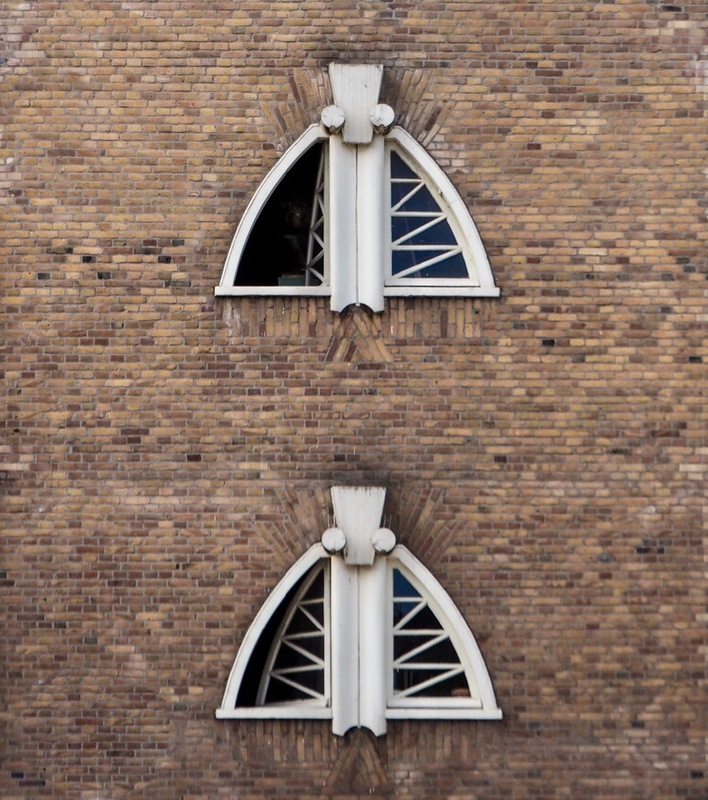 Two massive brick facades face off against each other here. 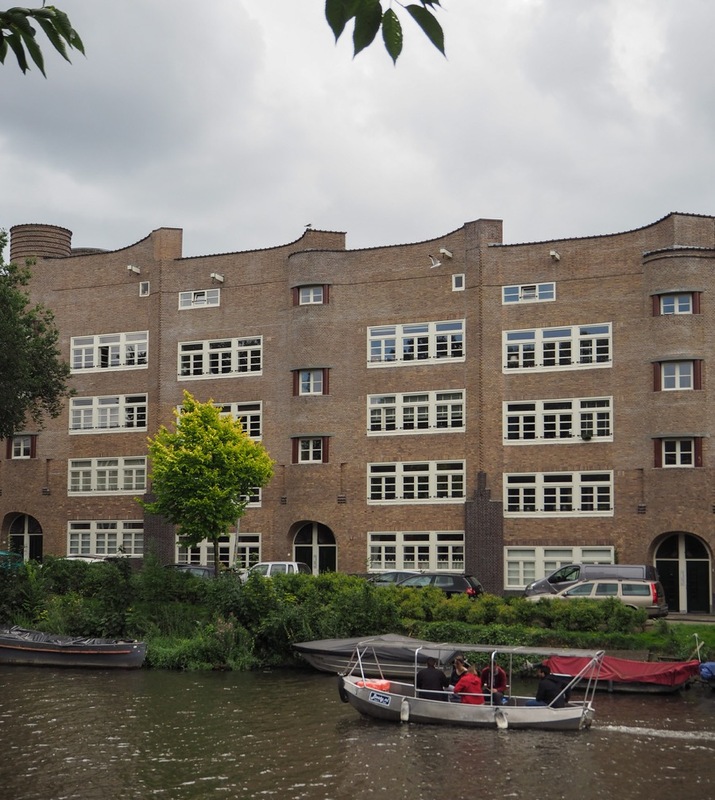 This is the De Dageraad building. 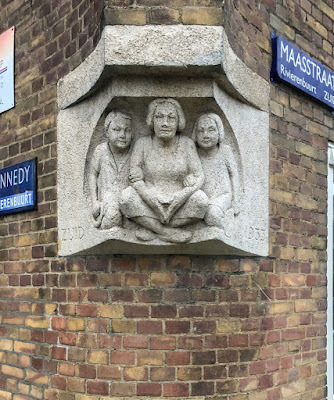 De Dageraad was a housing corporation, tasked with accommodating the working poor. Its name is a clear socialist reference: Dageraad means A New Dawn, the start of a new era where the workers of the world would unite, and pay lower rents to boot. Let's face it, you never knew bricks could do this. 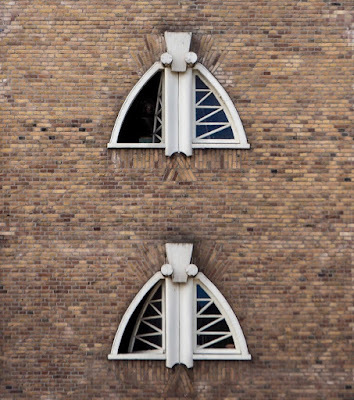 Rather than a pointed roof or a charming stepped gable, this is an undulating mass of dancing bricks. Twice. A new dawn had indeed broken, at least architecturally. Just a few steps north of here is the Coöperatiehof (the Cooperative Court, meaning a workers' cooperative: this is what happens when you put the left-wing liberal elite in charge). Gable stones are a common sight on Amsterdam's 17th century canal houses, and the tradition continues here with the reading room's magnificent door marker, which shows the Key of Wisdom (i.e. books) ready to unlock the workers' minds. Notice the menacing (and evil!) snake on the side, just like in the Garden of Eden. Don't be led into temptation! Read a book instead. The Key of Wisdom, flanked by the tempting snake. Another classic Amsterdam School doorway. The neighbourhood was purposely designed without a pub- instead of drinking, the workers had to read. The other traditional communal focal point would be a church- which was purposely left out as well. 'Opium for the masses' and all that. But hey, workers still had to show up on time, and so a strictly secular clock tower graces the backside of the building. All of this was designed by architect Piet Kramer, about whom we'll hear more later. Continue you tour with a short stroll down PL Takstraat, peering at the beautiful workers' homes here. 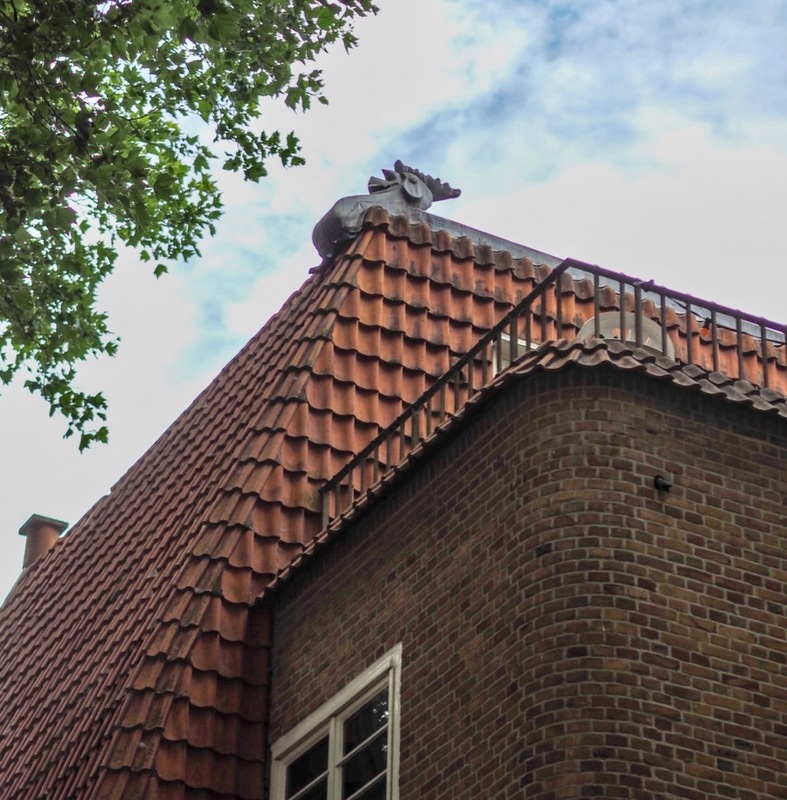 Keep an eye out for the socialist rooster, crowing in a New Dawn at PL Takstraat 29. 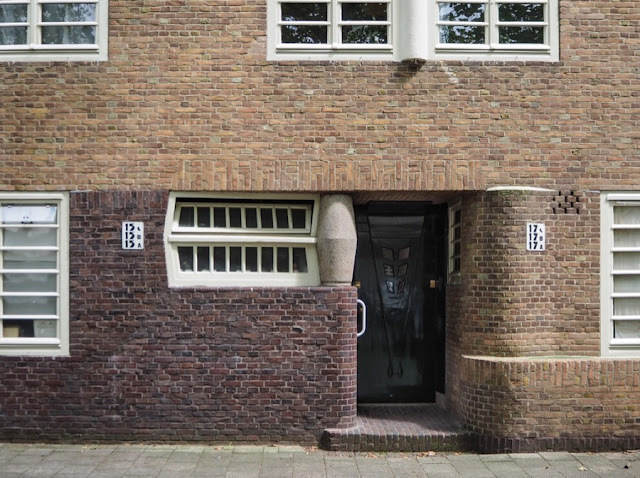 Houses on the PL Takstraat. notice the Art Deco numbering. At the corner with the quay (the J Israëlskade), you will find the Berlage Lyceum (high school), a monumental pile designed by AJ Westerman. What really stands out though are the sculptures done by Hildo Krop, a name we will see time and time again. Krop was the official City Sculptor (how's that for a job title?) Krop's work can be found on a gazillion bridges and buildings dating back to the interwar period. 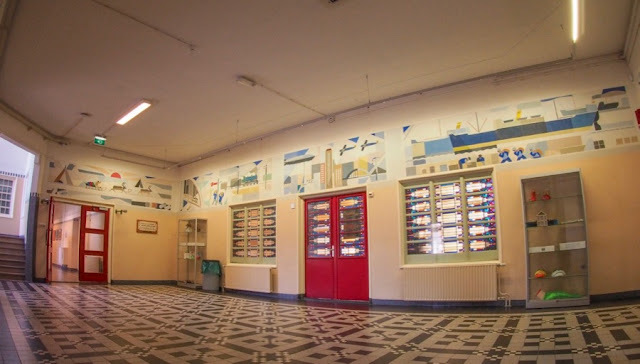 If you sneak into the school you'll be in for a few more architectural treats: heavily ornamented doors, wrought iron, and strictly geometric stained glass, another typical feature of the Amsterdam School. 1000s of pupils have walked through these doors. 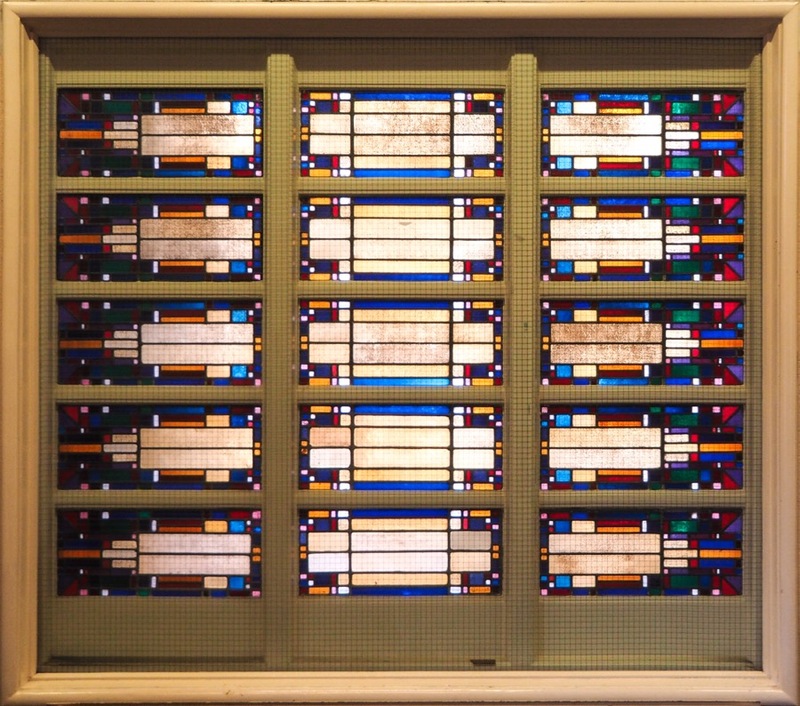 Typical Amsterdam School stained glass. 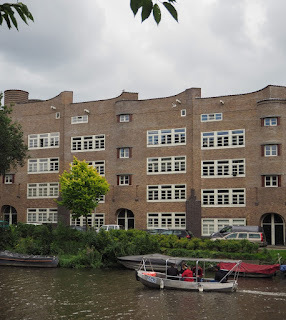 The school flanks the water, and if we follow it eastwards, we pass a number of undulating buildings, until we arrive at a typical Amsterdam School bridge, the Kramerbrug. Piet Kramer, the architect of the reading room we came across earlier, was a bridge builder par excellence. 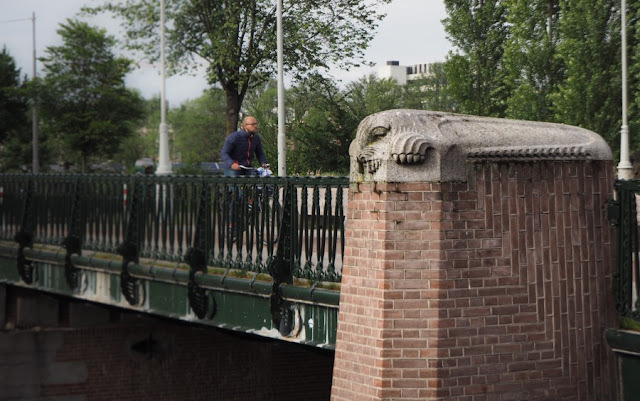 Criss-crossed by canals, the city needed bridges, and Kramer built around 200 of them. 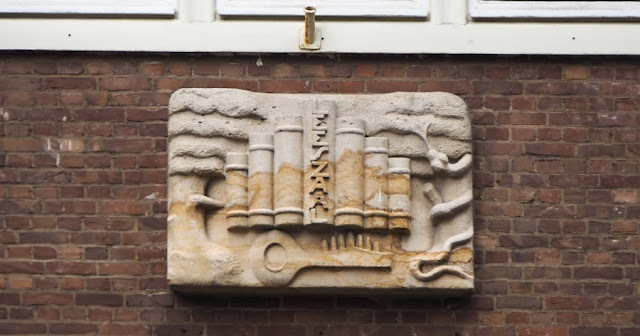 Like Krop the sculptor, he was employed by the City and left his mark widely, often in conjunction with Krop. 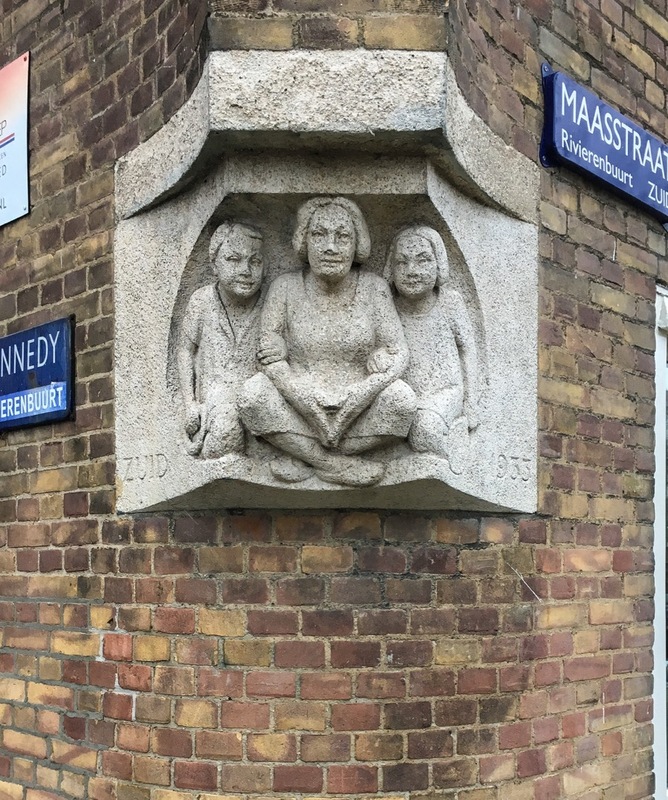 Krop's sculpture on Kramer's bridge. A turret for the bridge's guardian. If you saunter all the way to the western side of the Israelskade, you'll find another classic 'Kramer & Krop' bridge: the Boerenweteringbrug (try saying that quickly), with more outstanding sculptures and of course the inevitable chained bikes. Another Krop sculpture on a Kramer bridge. Don't limit yourself to these landmarks. There are plenty of other gems to be found. 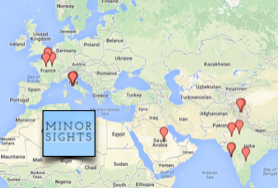 We've shown a few random samples here, just to whet your appetite. 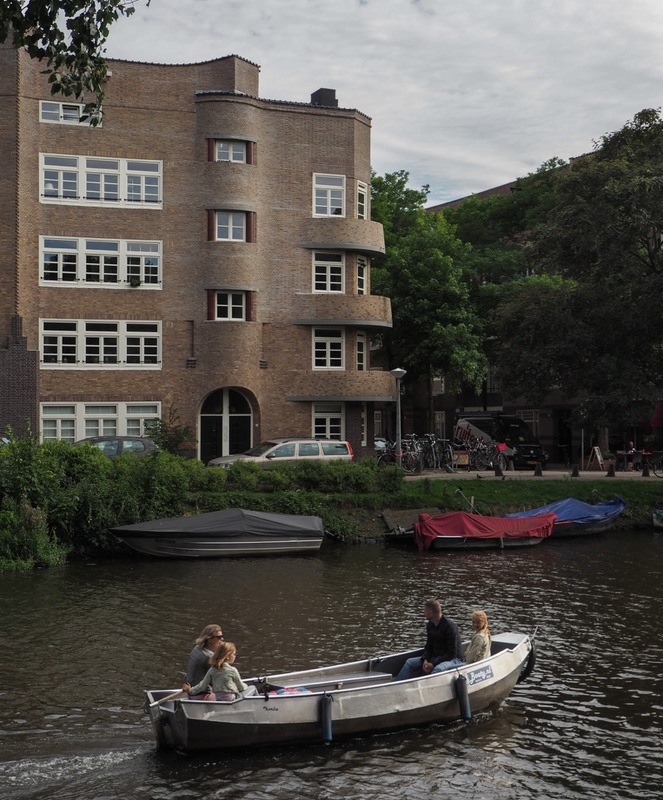 Go out and make your own discoveries in the fascinating neighbourhood. A working-class mom and her two daughters. As ever, the intent was to glorify the commoners, not the rich and famous. 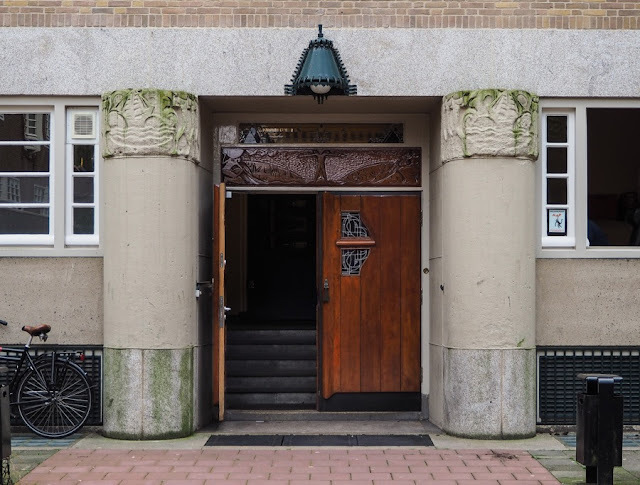 Last but not least: if you dig bricks, you'll probably enjoy our other article on the the Amsterdam School, Museum Het Schip. This being Amsterdam, a bike is probably the best way to get here and to move around the various architectural gems. Trams number 12 and 4 will bring you pretty close though, and even if you arrive here by bike, walking is probably the best way to get around and explore at your leisure. 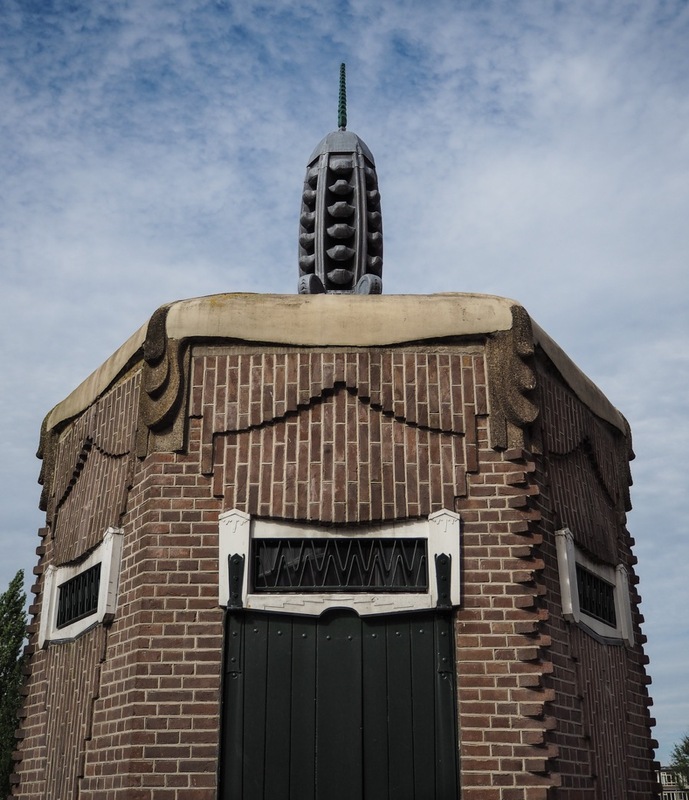 There is a useful Visitors Center at De Dageraad, a branch of the Museum Het Schip. The Center organizes walking tours and has lots of information. Check their opening hours on their website. 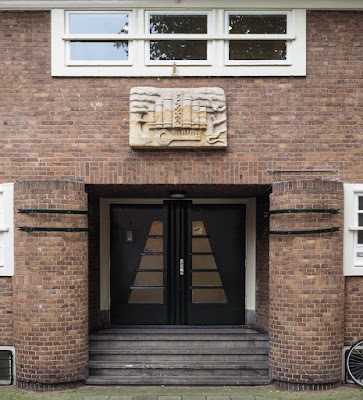 The most exhaustive source of information on the Amsterdam School is the website Wendingen, maintained by the Museum. 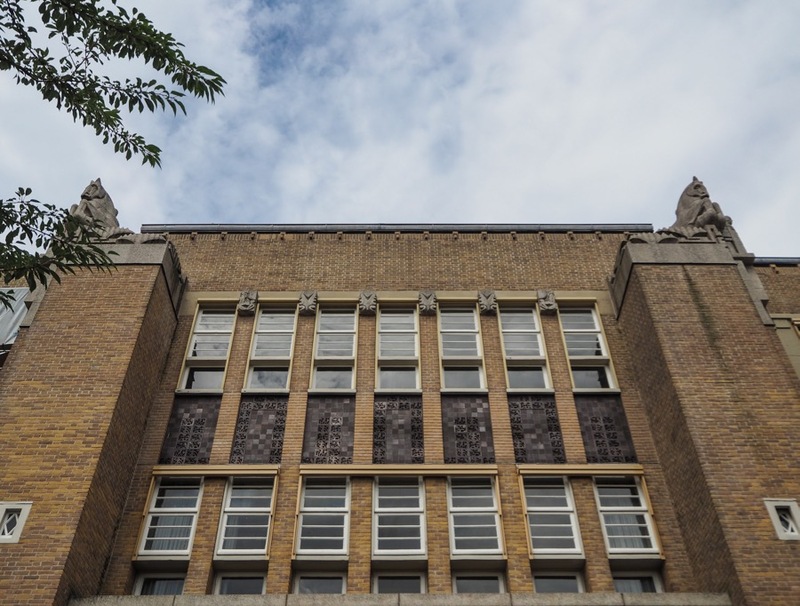 Practically every building with a connection to the style has been documented here, including the various protagonists of the movement.